Junior Ellie Brandt lines up a put during the MIAC Championships in the fall. The team competed strongly at the Carleton Invite, finishing in fourth place. The Gustavus Women’s Golf Team looked to finish their spring season on a high note this past weekend at the Carleton Invite. Last time out, the Gusties earned a sixth place finish at the Wartburg Invite in Waverly, IA. That strong performance was highlighted by Senior McKenzie Swenson’s second straight top-three finish. Senior McKenzie Swenson shoots for the green in a competition last season. Swenson led the Gusties at the Carleton Invite with a score of 74. “Swenson has had a great couple of weekends. Right now all aspects of her game are solid and it is fun to see her excel in her senior spring. Her hard work is really paying off,” Assistant Coach Randy Stuckey said after the weekend in Iowa. Senior Jessica Nelson also had a successful weekend and turned in scores of 81 each day to finish in 17th place. Sophomore Morgan Bleyhl dropped six strokes on the second day to move up from 29th to 20th overall. Junior Ellie Brandt rounded out the Gusties top four scores with back-to-back scores of 87 to tie for 38th. After a harsh spring full of wintry weather conditions, the Gusties got to enjoy normal spring conditions in their last competition of the season. The first day of the two-day event was held at Willingers Golf Club in Northfield, MN, which the Gusties had never played at before. 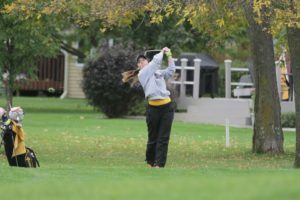 The Gusties put together a total score of 335 which left them in fourth place going into the second day. Sophomore Kristen Cash, Nelson, and Swenson all tied for the Gusties top score with an 82 and sat tied for 17th place. Ellie Brandt carded an 89 and was tied for 32nd. Bleyhl finished with a 91 and was tied for 38th. “Everyone had a good stretch of holes, but also had a few holes where we struggled. We are playing Northfield Golf Course tomorrow, which we have played a number of times. We’re looking forward to finishing the season on a good note,” Head Coach Scott Moe said at the conclusion of the first day. On day two, the Gusties were able to shave seven strokes off their day one total and maintained their fourth place finish through to the end of the tournament. Swenson was once again the major headline for the Gusties, with a score of 74. She went two-under par over the last five holes, and finished an illustrious college career with a birdie on her final hole. She finished tied for fifth place overall as an individual. Fellow senior Jessica Nelson posted a final round 85 and finished in a tie for 21st. “You see a couple of seniors in McKenzie and Jess and reflect on everything they had to do with our program over the last four years. It was great to see their family and friends come out and cheer them on over the final round,” Moe said. The other three Gusties also put together solid rounds in the final round of the season. Kristen Cash tied for 17th after a day two score of 84, Ellie Brandt shaved four strokes from her day one score and finished in 31st, and Morgan Bleyhl also improved on day two to finish in 39th. “Our team battled. The spring was really tough on everyone. When you travel south playing a tournament and come home to practice inside and get ready for your next tournament, it’s really tough mentally, but I’m proud of how we responded each week,” Moe said. The Gusties proved resilient all spring as outdoor practice time was limited and the schedule was subject to countless changes and postponements. They fought through poor conditions and competed well at every opportunity. “I just want to thank Mac and Jess for their time over the last four years and wish them nothing but the best as they take on their next adventure,” Moe said.